DESPITE BEING AN activity we do every night, it can be difficult to get a good night’s sleep every night. Late nights, early mornings, what we do before going to bed and other factors can disrupt your sleep pattern and leave you feeling groggy the next day. If you’re looking for a way to improve this without breaking the bank, there are a number of apps and devices out there that could help you out. Unless you have a health issue, there are some things you can do that will help you sleep better. Apps and devices won’t achieve much if your day-to-day routine is working against you so here are a few to keep in mind. - Stick to a sleep schedule. The more consistent you are, the easier you will find sleeping and waking up as your body clock adjusts. - Don’t look at your phone for long before bed. A minute or two is fine, but playing games, watching YouTube or reading on your phone for a prolonged period of time will leave you feeling wired and unable to sleep. - Exercise daily, or failing that as often as you can. - Avoid naps if possible. - Watch what you eat before you go to bed. Avoid alcohol or caffeine as that will disrupt your sleep. There’s certainly no shortage of apps that claim to help you get a good night’s sleep. The majority of them track your movement and use that to determine the quality of your sleep while others use noises and techniques to help ease you to sleep. The biggest thing to keep in mind is that said apps give approximate estimates of your sleep pattern as they’re really only tracking one aspect: movement. If you’re looking for something more exact, you will need to go further than an app and invest in a device instead. One of the more popular smart alarms out there, Sleep Cycle detects your movement while you’re in bed and determines the best time to wake you up. Each night, it gives you stats on how well you slept and what days were better for you, and can also provide white noise to help you sleep. Similar to Sleep Alarm, Sleepbot is a free download which provides similar features to Sleep Cycle above and is feature rich. Numerous functions including sound-tracking, ambient noise, tips and graph trends makes it a great download. One of the nicest looking app on iOS, Pillow includes a tracker, stats, tips on how to get a better sleep and audio recording, which activates whenever you begin talking or breathing heavily. The premium version includes Powernap modes, greater stat detail, and sleep aid programmes to help you out and is probably one of the more detailed trackers out there. One for Windows Phone users, Sleep Timer does exactly what it says on the tin. Set the time and amount of sleep you want and it will wake you up at the appropriate moment. Sleep Bug uses ambient sounds to help you get to sleep, but instead of choosing specific sound effects, you choose scenes. These scenes have their own background sounds which you can mix together to create your own custom scene. For those who would like a more meditative state of mind, Deep Sleep gets you to put on your headphones and meditate as a way of helping you drift to sleep. What gadgets are out there? If the thought of using an app isn’t to your liking, you could go a step further and invest in a wristband or device instead. As well as being fitness devices, gadgets like the Jawbone Up and FitBit One also include sleep tracking features that will take into account your heart rate, how many times you wake up and how well you sleep. 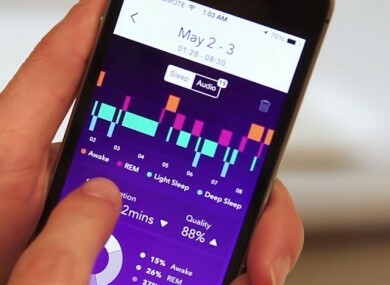 The data from these devices can be more exact than what you get from apps alone, but it’s better if you’re purchasing one for fitness purposes as well, unless you’re absolutely serious about the quality of sleep you get. Email “Looking for a good night's sleep? Here are your options”. Feedback on “Looking for a good night's sleep? Here are your options”.